It’s Wednesday morning and Nick Heywood is in his car making the nine-hour round trip from Wagga to Sydney for a single ride at Warwick Farm. He will go on to almost win the race on $17 outsider Catmosphere, although that probably seemed an unlikely result when he accepted the assignment. This attitude has seen the 22-year-old hoop go from strength to strength in his first few months as a senior jockey. Heywood’s final season an apprentice under the guidance of Peter and Paul Snowden was highly successful. He was runner-up in the NSW Apprentice Jockey Premiership and finished the season with 70 wins and 123 places to his name. This season is shaping up to be even better. He’s already notched 67 wins including a treble on Wagga Gold Cup Day, is ranked 16th overall in NSW and 7th in Country NSW. Nick Heywood after a recent win for Matthew Dale. Credit: Bradley Photos. Consistent he is. Heywood boasts a winning strike rate of 18.7% and 43.2% for placings. He attributes his success to focusing on the things he can change and accepting the things he can’t. Heywood chose to move back to his home town of Wagga after completing his apprenticeship in Sydney. As one of the tallest jockeys he was battling to keep his weight down at the level needed to secure rides as an up and coming jockey in the city. Heywood has worked hard to establish a solid base in the Southern Districts. 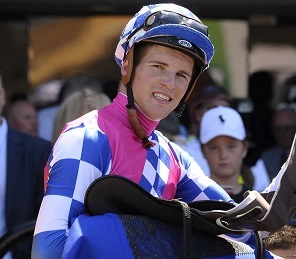 He rides track work in Wagga and also travels to Canberra and Goulburn once a week to ride for Matthew Dale and Danny Williams. He covers thousands of kilometres every week chasing race rides all over the state and it’s paying dividends. If Heywood had his way when he was a teenager he wouldn’t have become a jockey though. Despite being the son of prominent Wagga horse trainer Chris Heywood, he was far more interested in footy and motorbikes. “I was always trying to bulk up so I could make the rep side but I stayed light so I decided to give being a jockey a crack,” he said. Heywood started his apprenticeship with Peter Clancy at Leeton before moving up to the big smoke.